The first wagon, when finished with shelves on the outside and a place for storage of cases in the center resembled somewhat a cross between a grocer's delivery wagon and the tin peddlers cart of by gone New England days. 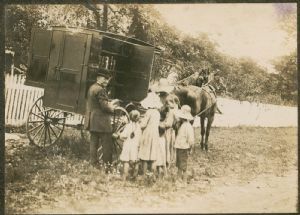 Filled with an attractive collection of books and drawn by two horses, with Mr. Thomas the janitor both holding the reins and dispensing the books, it started on its travels in April 1905. Some of the youngest patrons. Included in Annual report, 1905-1906. This photograph was part of Miss Chrissinger's collection, donated to the library by Rosalie Layman. The title is from Miss Chrissinger's album.